HomeAnalysisMerck’s Recombivax Vaccine Shortage … Less Baby Deaths …??? In the summer of 2017, a malware virus mainly affecting the Ukraine, found its way onto the mainframe computer systems of Merck wreaking havoc for the company. The malware was called “NotPetya,” referring to the ransomeware family Petya, which disables computer systems and demands a ransom to be paid in bitcoin before it will restore access to a company’s files. It is destructive and costly, something Merck was to find out as its sales and manufacturing operations were disrupted by the June 7th attack. According to the Wall Street Journal, the incident cost the pharmaceutical giant $670 million to remediate, but more importantly, it caused disruption to the production of two of Merck’s pediatric vaccines: Gardasil 9 (Human Papillomavirus) and Recombivax (Hepatitis B virus), vaccines to help prevent sexually transmitted infections. During the crisis, Merck borrowed from a CDC vaccine stockpile, in order to meet supply commitments for Gardasil 9. However, that was not the case with Recombivax, the Hepatitis B vaccine given to all babies beginning the first day of life. There is no clear medical reason for giving every baby a vaccine against hepatitis B if its mother tests negative for the disease. Nevertheless, American babies receive three doses each, which is 12 million doses in any given year for the US alone. Following the cyber-attack, Merck was unable to meet this high demand, citing production problems. The CDC acted quickly in asking GlaxoSmithkline to supply its Hep B vaccine Engerix-B, to meet the needs of the US market. The CDC published a notice about a shortage of Recombivax on July 28th 2017 on its website, stating that the vaccine would be unavailable as of early August 2017. GSK was able to supply a monovalent (single) vaccine for the birth dose and subsequent newborn doses. Doctors could give the pentavalent combination vaccine Pediarix to older babies, depending on supply. Just prior to the ransomware attack, two scientists from Europe wrote to the FDA to express concern that recent research on aluminum adjuvants in vaccines suggested that these adjuvants were contributing to Autism Spectrum Disorder and other neurological disorders. Merck initially expected to resume distributing Recombivax in February of 2018. However, this deadline came and went and the expected resumption of distribution was pushed back many times. Currently, the CDC is reporting that Recombivax will not be available until the middle of 2019, almost two years since the cyber-attack happened and without the public fully understanding why this particular vaccine was affected. What are the wider ramifications of this incident? Just prior to the ransomware attack, two scientists from Europe wrote to the FDA to express concern that recent research on aluminum adjuvants in vaccines suggested that these adjuvants were contributing to Autism Spectrum Disorder and other neurological disorders. There is growing concern among some scientists about the aluminum adjuvant load in vaccines and its effects on the neurological health of children. Researchers are particularly concerned with Merck’s highly immunogenic adjuvant, Amorphous Aluminum Hydroxyphosphate Sulphate (AAHS). Gardasil and Recombivax are the only vaccines licensed to contain AAHS. Some scientists believe it may contribute to serious autoimmune conditions referred to as Autoimmune/Inflammatory Syndrome Induced by Adjuvants or ASIA. Very often, when the safety of AAHS is questioned in Gardasil, the response from vaccine proponents is to say that it is the same adjuvant in the Hep B vaccine given to babies for many years, so it must be safe. That is only acceptable if Merck’s Recombivax vaccine is entirely safe for babies, which is difficult to measure. Since the ransomware attack however, there may now be a way to examine the relative effects of the swift change to GSK’s vaccine. Did a Natural Experiment Occur? Could there be an effect on vaccine reactions if one highly immunogenic adjuvant was removed from the earliest possible childhood immunizations? What happened since Recombivax went out of production in July 2017? The only way researchers can look at reactions is through the Vaccine Adverse Event Reporting System (VAERS). 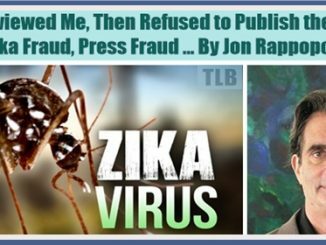 It is a passive system not without errors, but most reports are by physicians, medical professionals and vaccine manufacturers themselves. A further limitation of VAERS, is that it only captures between 1-10% of reportable reactions, thus it significantly under-reports, which should be kept in mind when looking at data. Following the cyber-attack in June 2017, for the first time in a very long time, researchers have the ability to view in plain sight, a natural experiment whereby one vaccine was abruptly swapped out for another – replacing the very adjuvant many critics are concerned about, AAHS – with an aluminum hydroxide adjuvant contained in Engerix-B. Neither has a published independent safety profile but AAHS is suspected to be more problematic due to its immunogenicity profile. We now have more than a year’s worth of data to examine since the attack in 2017 when Engerix-B was introduced. On average there were 29 deaths reported annually for fifteen years prior to the attack (2003 to 2017). In 2018 there were only 6 reported (to end of November 2018). Two of those deaths followed Recombivax. Assuming the same death rate to the end of the year, at most there will be 7 deaths recorded, resulting in roughly 75% less deaths since Recombivax was discontinued as a pediatric vaccine. 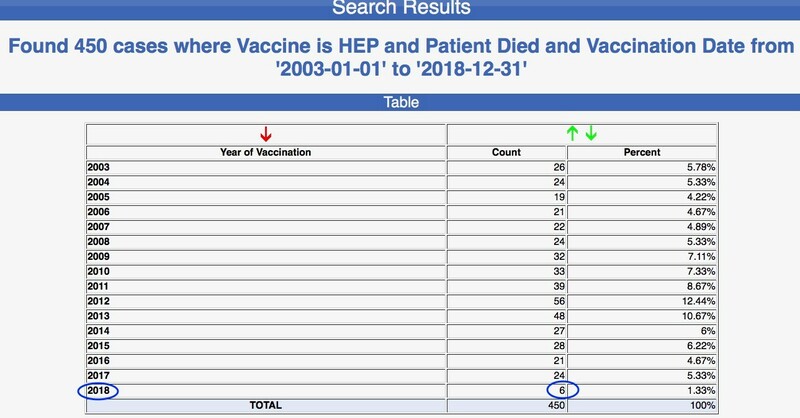 Source: VAERS Hep B reported deaths annually 2003 – 2018. Injuries have also halved since Engerix-B was introduced, from on average 1,400 reported annually from 2003 to 2017, to 756 cases in 2018 with one month’s reporting yet to be recorded. 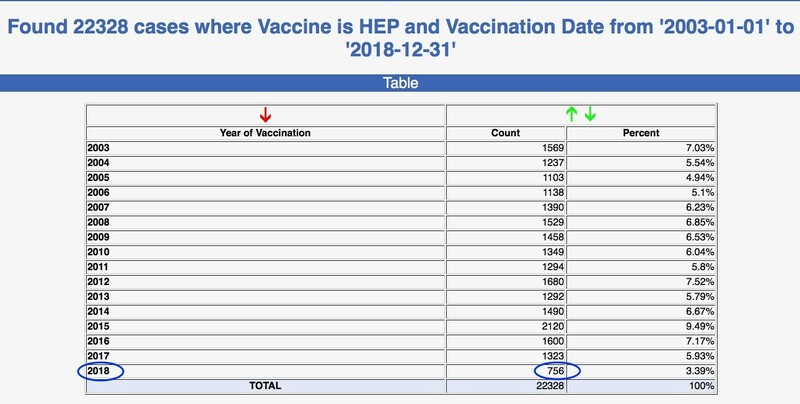 Source: VAERS Hep B reported injuries annually 2003 – 2018. There is an obvious suggestion that GSK’s vaccine is a safer option for parents and pediatricians. Of course, a more in depth analysis is needed. Moreover, because VAERS has incomplete data, it warrants an immediate FDA investigation since most of these deaths occur in babies under three years old. It is unknown whether this anomaly was as a result of the switch to the GSK version of the vaccine, but considering the concern some scientists have over the lack of science and unsupported safety of Merck’s AAHS, the FDA should be concerned. At the very least, there should be a moratorium on reinstating Recombivax until the disparity can be investigated. Vaccine safety should be everyone’s concern, not just vaccine safety advocates. The precautionary principle must be invoked where there is doubt. We hope the FDA agrees.